Ensemble mean removal is often performed in multi-variate time series analysis, when one suspects global instantaneous fluctuation of signal is additively introduced, and wants to remove it. For example, if a time series of images are provided as the signal, there may be additional uncontrolled light source mixed with the intended signal, and it is desirable to remove this effect. Ensemble mean removal in the simplest case can be simply done by taking the instantaneous temporal mean, and subtracting it from each channel. When the gain of each channel is assumed to be heterogeneous (but with same sign), one can still take the ensemble mean and compute the optimal gain for each channel. When taking the ensemble mean, the assumptions is that the time-locked common component to signal ratio increases, so given enough channels (at least more than 10). Note that if where is the observation from channel i, is a zero mean random process that is spatially independent, and is the fixed realization of a zero mean random process with variance fluctuation among the channels, the instantaneous cross-correlation is . Hence if are all positive (or all negative), such common additive fluctuation creates positive correlation. Therefore ensemble mean introduces negative correlation. The following MATLAB code demonstrates it. 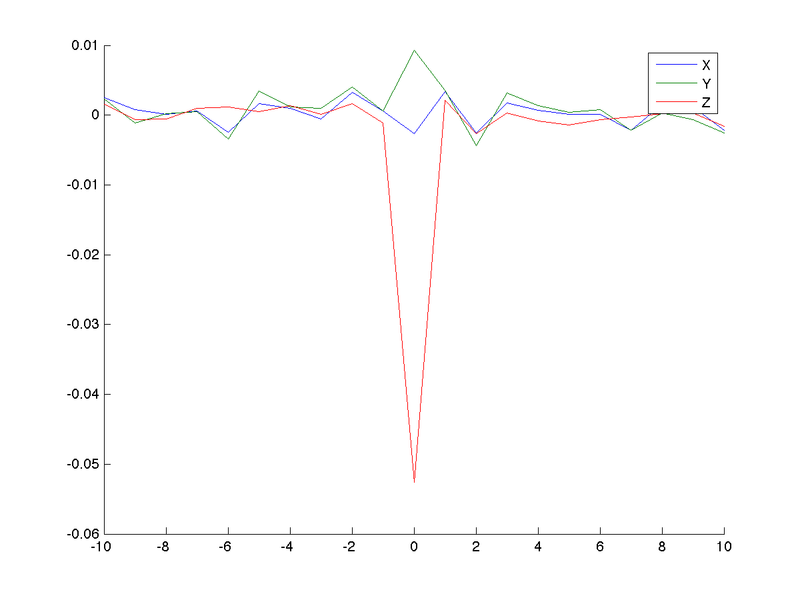 The blue line corresponds to the independent signal, the green the common fluctuation added, and the red the ensemble removed. where the function meanXcor is simply computes the mean pairwise cross-correlation. click through on the figure, it is much easier to see the green line. Solid post Memming, thanks!